Margaret L. Daigh (nee Dittman), age 98, of Downingtown, PA, formerly of Drexel Hill, PA, passed away on August 11, 2018. Born in South Dakota, she was the daughter of the late Walter and Josie Dittman (nee Spratford). 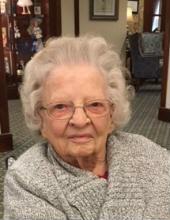 Margaret enjoyed jigsaw puzzles, bowling, going to the casinos and being with family and friends. Margaret was predeceased by her beloved husband, Donald L. Daigh and her son, Jim Daigh. She is survived by her loving children Margaret Winkler (Bob), Lee Daigh (Patti), John Daigh (Michelle), Kathy Cola (Art), her daughter-in-law Dana,14 grandchildren, 19 great-grandchildren and her sister, Katherine Huber. Relatives and friends are invited to her viewing Friday, August 17, 2018 9:30-10:30 AM at Marple Presbyterian Church, 105 N. Sproul Road, Broomall, PA and to her Funeral Service 10:30 AM. Interment Arlington Cemetery, Drexel Hill, PA.